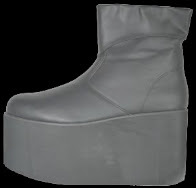 Your Frankenstein Monster getup isn’t complete until you slide into a pair of 4-3/4 inch platform shoes. Don’t forget to duck through doorways, and watch out for snapped ankles. Now priced to move, from Buycostumes.com. 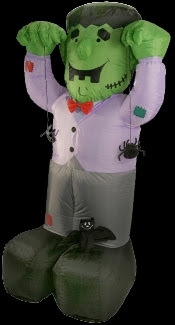 This nylon, four-foot tall, inflatable Frankenstein Halloween porch decoration comes with dangling spiders and its own self-contained fan. Display year-round to confuse the neighbors. 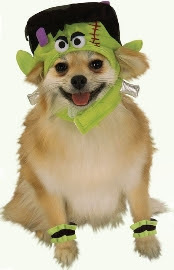 Transform Poochy into an amusing creature made of reanimated dead body parts with this lightweight velcro-strap headpiece and elastic cuffs. Do NOT attempt this with a large, ill-tempered cat. awww...look at the cute dog made up of other dead dogs' parts!